Teucrium polium L. (Labiatae) is a medicinal plant and a rich source of different bioactive compounds. Studies have established various pharmacological effects such as antioxidant, antidiabetic, antispasmodic, antihypertensive, cardiotonic, antinociceptive, antigastric ulcer, anti-inflammatory, and cytotoxic properties for T. polium.,,,,, Plants belonging to the genus Teucrium are popular for their hypoglycemic and hypolipidemic activities. Some studies have shown the lipid-lowering activity of aqueous extract of T. polium in hyperlipidemic rats., To obtain the most efficient herbal fraction for isolation and identification of the metabolites responsible for hypolipidemic activity, the present study aimed to investigate the effect of different fractions of T. polium on serum lipid profile in dexamethasone (Dex)-induced hyperlipidemic rats. The biochemical kits for evaluation of lipid profile, alanine aminotransferase (ALT), and aspartate aminotransferase (AST) were purchased from Pars Azmoon Co. (Iran). Folin–Ciocalteu reagent and all other chemicals were purchased from Merck Co., (Germany). Aerial parts of T. polium were collected from Shahrekord in Chaharmahal and Bakhtiari Province, Iran in May 2015. It was identified by a botanist (Dr. Mustafa Ghanadian, Department of Pharmacognosy, School of Pharmacy and Pharmaceutical Sciences, Isfahan University of Medical Sciences, Isfahan, Iran) and its voucher specimen (no. 2718) was deposited at the Herbarium of Isfahan School of Pharmacy and Pharmaceutical Sciences. For preparation of hydroalcoholic extract, the air-dried plant material (3 kg) was soaked in percolation tank using ethanol: water (70:30) for 3 days and then extracted with a flow of 2 mL/min for 5 days. It was filtered and concentrated by rotary evaporator at 45°C to yield a green viscous residue (257 g). This extract was dissolved in methanol: water (70:30) and partitioned with hexane in a separation funnel to give a biphasic solution. Upper solution (hexanoic part) rich in chlorophyll and fats was discarded and methanolic part was concentrated, suspended in water, and then successively partitioned between equal volumes of chloroform and butanol to give chloroform, butanol, and aqueous fractions. Each fraction was evaporated under vacuum condition and kept in refrigerator at −20°C until use. Determination of total phenolic content was performed using colorimetric Folin–Ciocalteu procedure. Briefly, each plant sample (20 μL) was mixed with diluted Folin–Ciocalteu reagent and sodium carbonate (20%). After 120 min, absorbance was read at 765 nm by a ultraviolet-visible spectrophotometer. Total phenols' amount was estimated using a standard curve of gallic acid and was expressed as milligram of gallic acid equivalents (GAEs)/100 mg of the dried plant extract in three independent experiments. Male Wistar albino rats weighing 200–220 g were obtained from the animal house of Isfahan School of Pharmacy and Pharmaceutical Sciences. Animals had free access to tap water and standard rat pellet and were kept under standard laboratory condition including a 12 h light/12 h dark cycle and 20°C ± 2°C temperature. The experiment was conducted according to the international guidelines for laboratory animal use and care. Rats were randomly divided into 15 groups of 6 rats in each. To induce hyperlipidemia, animals received subcutaneously (s.c.) injection of Dex (10 mg/kg/day) for 7 days. In the test groups, rats received Dex and simultaneously treated orally with 50, 100, or 150 mg/kg of T. polium hydroalcoholic extract or different fractions using an intragastric tube. Negative control group received daily injection of saline (1 mL/kg, s.c.) and orally administration of the vehicle (carboxymethyl cellulose 1% in water). Atorvastatin (40 mg/kg, orally) was administered as a reference treatment in positive control group. At the end of the experiment on day 8, blood samples of overnight fasted rats were collected from retroorbital plexus with heparinized capillary tubes under light ether anesthesia. Serum was collected for biochemical analysis and animals were sacrificed by an overdose of anesthetic. For estimation of hepatic marker enzymes (ALT, AST) and lipid profile including triglycerides, total cholesterol, and high-density lipoprotein-cholesterol (HDL-C), the respective biochemical kits were used while low-density lipoprotein-cholesterol (LDL-C) and atherogenic index were calculated using the following formulas: LDL-C = cholesterol − (triglyceride/5) − HDL-C and atherogenic index = (total cholesterol − HDL-C)/HDL-C. All experiments were repeated at least three times. The results were reported as mean ± standard error of mean. For statistical evaluation, one-way analysis of variance followed by Tukey post hoc test was performed using SPSS software version 18.0 (SPSS Ltd., Quarry Bay, Hong Kong). P < 0.05 was considered statistically significant. T. polium was standardized based on its polyphenoic contents. The hydroalcoholic extract, chloroform, butanol, and aqueous fractions were contained %7.53 ± 0.55, %2.64 ± 0.47, %11.51 ± 0.46, and %13.48 ± 0.33 GAE (mg/100 mg), respectively. Administration of Dex resulted in a significant increase in serum triglyceride level (P< 0.001). Atorvastatin and chloroform fraction (at all doses) significantly reduced triglyceride level compared to Dex control group (47.8% and 60.2%, respectively). However, there was no significant difference between 3 doses of chloroform fraction. Hydroalcoholic extract and butanol fraction at the dose of 50 mg/kg (P< 0.001) and aqueous fraction at the dose of 150 mg/kg (P< 0.05) were found to be effective in decreasing triglyceride level (27.0%, 43.9% and 19.9%, respectively). Maximum reduction of 60.2% was observed for chloroform fraction at the dose of 150 mg/kg [Figure 1]. The post hoc analysis of results also showed significant differences between the chloroform fraction at the dose of 150 mg/kg with other fractions at their highest dose (P< 0.001). Dex caused a significant elevation in cholesterol level (P< 0.001). 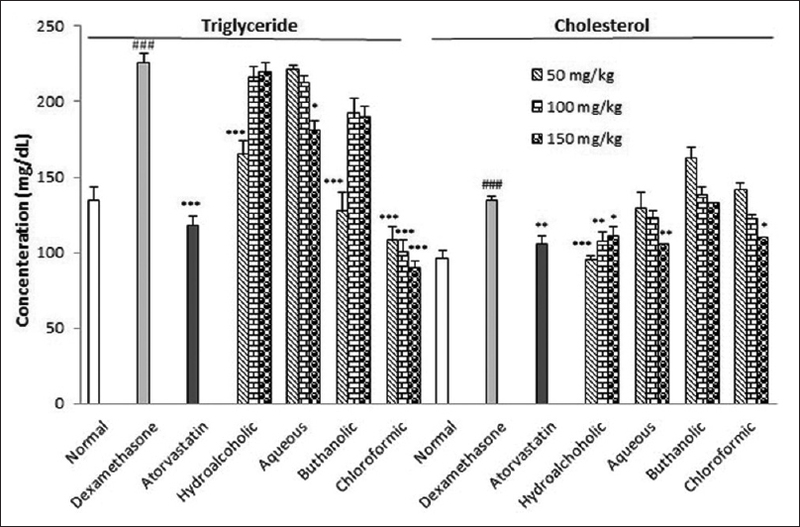 As shown in [Figure 1], atorvastatin significantly reduced cholesterol level (21.3%). Hydroalcoholic extract reduced cholesterol concentration at all doses; however, it was more effective at the lowest dose (29.0%). Aqueous and chloroform fractions showed lowering effect at the dose of 150 mg/kg (21.2% and 17.96% reduction, respectively). More analysis of groups also revealed significant differences between the hydroalcoholic extract at the dose of 50 mg/kg with other fractions at their lowest dose (P< 0.001). No cholesterol-lowering effect was observed for butanol fraction. Significant decrease in HDL level was observed in Dex-induced hyperlipidemic rats (P< 0.05). 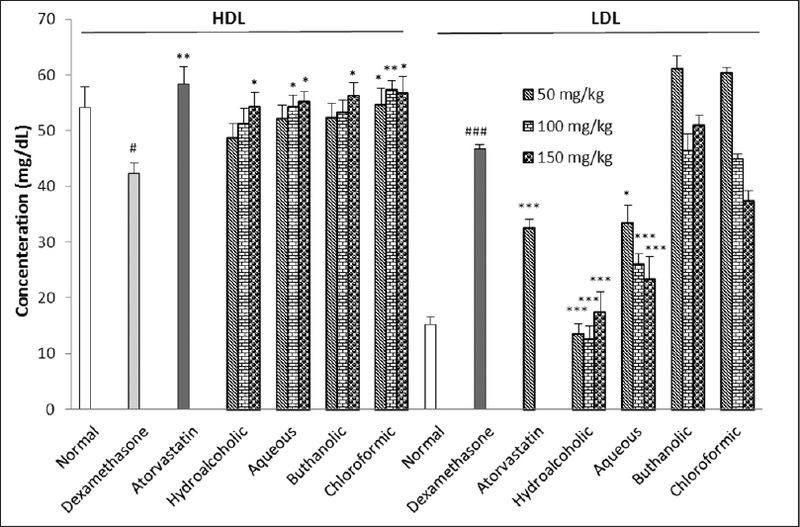 Treatment with atorvastatin, hydroalcoholic extract, and butanol fraction (at the highest dose) significantly increased HDL level (37%, 28% and 33%, respectively). Administration of doses of 100 and 150 mg/kg from aqueous fraction was also effective in increasing HDL (28% and 30%, respectively). However, maximum elevation of 35% in HDL level was found for chloroform fraction at the highest dose [Figure 2]. Multiple analyses showed no significant difference between various doses of different fractions. In Dex-induced hyperlipidemic rats, LDL level significantly increased compared to normal rats (P< 0.001). Treatment with atorvastatin and aqueous fraction (at highest dose) significantly reduced LDL level (30.1% and 50.0%, respectively). Maximum reduction of 72.9% was observed for hydroalcoholic extract. However, no lowering effect was observed on LDL concentration for butanol and chloroform fractions [Figure 2]. 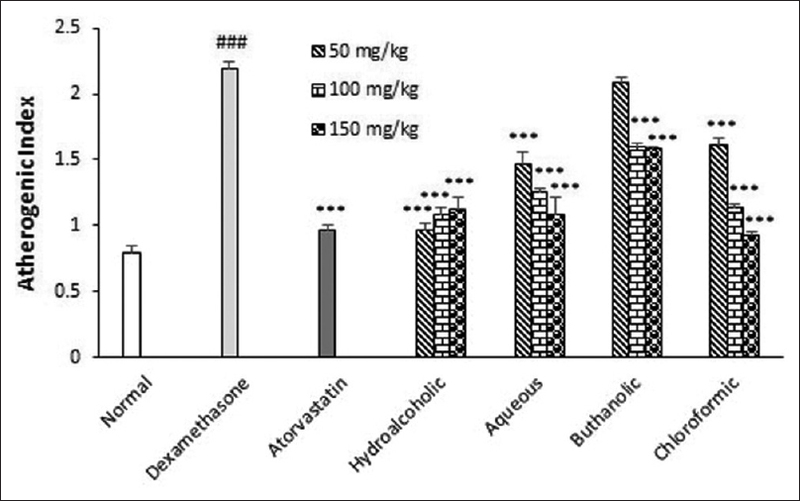 The post hoc analysis of results also exhibited significant differences between various doses of hydroalcoholic extract with different doses of other fractions (P< 0.001) except for aqueous fraction at its highest dose (P = 0.85). All treatments significantly (P< 0.001) decreased atherogenic index as a noteworthy predictor of atherosclerosis in hyperlipidemic rats [Figure 3]. More analysis of groups also showed significant differences between the hydroalcoholic extract at the dose of 50 mg/kg with other fractions at their lowest dose (P< 0.01). However, there was a significant difference at the dose of 100 mg/kg (P< 0.001) and 150 mg/kg (P< 0.01) only with butanol fraction. 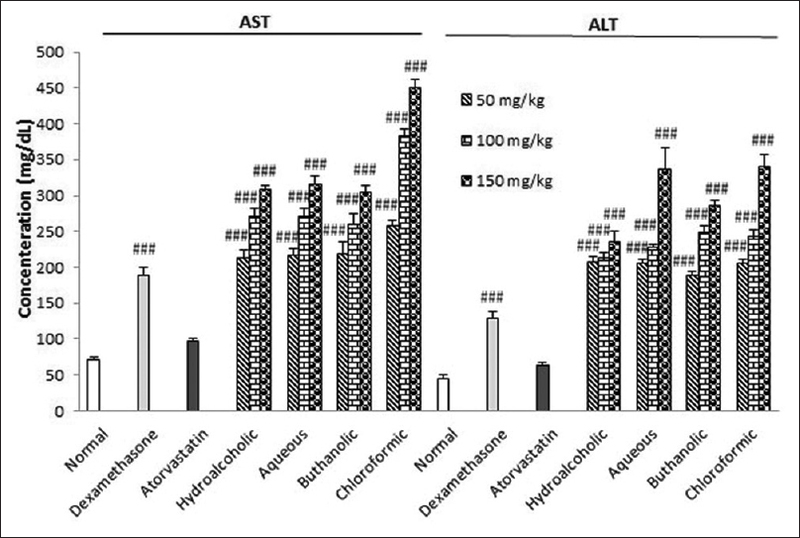 As exhibited in [Figure 4], administration of hydroalcoholic extract of T. polium and its fractions at all doses significantly increased serum level of ALT and AST in hyperlipidemic rats in a dose-dependent manner (P< 0.001). The less toxic effect on serum level of ALT was observed for hydroalcoholic extract, especially at the dose of 150 mg/kg compared with aqueous and chloroform fractions (P< 0.001). The most toxic effect on AST level was found for chloroform fraction at all doses compared with other fractions (P< 0.01 at the dose of 50 mg/kg and P < 0.001 at higher doses). Dex as a potent synthetic glucocorticoid is identified to cause hyperlipidemia through various mechanisms including decreased activity of lipoprotein lipase and increased secretion of very low-density lipoprotein (VLDL) by the liver, increased hepatic lipogenesis and accumulation of triglyceride within the liver, enhanced VLDL formation by intestine, decreased activity of lecithin cholesterol acetyl transferase and increased free cholesterol level, increased lipolysis in adipose tissue, and increased circulating fatty acids.,, Moreover, high level of glucocorticoids are associated with insulin resistance, hyperinsulinemia, and hyperglycemia which are also linked to dyslipidemia. Dex-induced hyperlipidemia is related with overproduction of reactive oxygen species (ROS) and oxidative damage in several tissues such as liver. In this study, treatment with almost all fractions of T. polium significantly reduced the level of serum lipid markers and increased the serum level of HDL. However, there was a striking elevation in hepatic marker enzymes. Among different fractions, chloroform fraction appeared to be more potent in hypolipidemic activity in a dose-dependent manner. It was comparable with atorvastatin (40 mg/kg) at the lower dose of 50 mg/kg. Aqueous fraction has also good antihyperlipidemic activity, but there was less hypolipidemic activity for butanol fraction. Previous studies have reported hypolipidemic effect for T. polium. Rasekh et al. showed 29%–46% reduction in total cholesterol and 34% reduction in triglyceride level by administration of T. polium water extract in an animal model of hyperlipidemia which was induced by administration of streptozotocin with high fat diet. In the study of Vahidi et al., the boiled aqueous extract of T. polium reduced serum glucose and triglyceride in diabetic rats but had no effect on cholesterol level. In spite of strong hypoglycemic activity, Shahraki et al. have reported no hypolipidemic effect for aqueous extract of T. polium in diabetic rats. This inconsistency in the results may be due to the dissimilarity in method of administration of T. polium extract. T. polium is considered as a source of bioactive chemical materials with potential pharmacological activity. Phytochemically, chloroform fraction is rich in terpenoids including abeo-abietane and neo-clerodane diterepenes, sesquiterpenes from eudesmane and germacrane types., Aqueous fraction contains polyphenolic compounds, and butanol fraction is rich in iridoids, phenyl ethanols, and flavonoids,, which could be considered as probable active constituents. However, further studies are needed to determine possible mechanisms of action of each constituent for the management of hyperlipidemia. In conclusion, this study showed strong hypolipidemic effect of chloroform, butanol, and aqueous fractions of hydroalcoholic extract of T. polium in an animal model of hyperlipidemia. Chloroform and aqueous fractions may be potential candidates for isolation of bioactive antihyperlipidemic constituents; however, identification and separation of hepatotoxic compounds and taking low doses should be considered for clinical application. The financial support of Vice Chancellor of Research of Isfahan University of Medical Sciences is greatly appreciated. This study was financially supported by Vice Chancellor of Research of Isfahan University of Medical Sciences (Research Project No. 394992). Howard-Alpe GM, Sear JW, Foex P. Methods of detecting atherosclerosis in non-cardiac surgical patients; the role of biochemical markers. Br J Anaesth 2006;97:758-69. Navab M, Ananthramaiah GM, Reddy ST, Van Lenten BJ, Ansell BJ, Fonarow GC, et al. The oxidation hypothesis of atherogenesis: The role of oxidized phospholipids and HDL. J Lipid Res 2004;45:993-1007. Dhaliya SA, Surya AS, Dawn VT, Betty C, Arun K, Sunil C. A review of hyperlipidemia and medicinal plants. Int J Pharm Sci Biomed Sci 2013;2:219-37. Kaur G, Meena C. Evaluation of anti-hyperlipidemic potential of combinatorial extract of curcumin, piperine and quercetin in triton-induced hyperlipidemia in rats. Sci Int 2013;1:57-63. Bello R, Calatayud S, Moreno L, Beltran B, Primo Yufera E, Esplugues J. Effects on arterial blood pressure of the methanol extracts from different Teucrium species. Phytother Res 1997;11:330-1. Niazmand S, Erfanian Ahmadpoor M, Moosavian M, Derakhshan M. The positive inotropic and chronotropic effects of Teucrium polium L. extract on Guinea pig isolated heart. Pharmacol Online 2008;2:588-94. Mirghazanfari SM, Keshavarz M, Nabavizadeh F, Soltani N, Kamalinejad M. The effect of “Teucrium polium L.” extracts on insulin release from in situ isolated perfused rat pancreas in a newly modified isolation method: The role of Ca 2+ and K + channels. Iran Biomed J 2010;14:178-85. Parsaee H, Shafiee-Nick R. Anti-spasmodic and anti-nociceptive effects of Teucrium polium aqueous extract. Iran Biomed J 2006;10:145-9. Mehrabani D, Rezaee A, Azarpira N, Fattahi MR, Amini M, Tanideh N, et al. The healing effects of Teucrium polium in the repair of indomethacin-induced gastric ulcer in rats. Saudi Med J 2009;30:494-9. Rajabalian S. Methanolic extract of Teucrium polium L. potentiates the cytotoxic and apoptotic effects of anticancer drugs of vincristine, vinblastine and doxorubicin against a panel of cancerous cell lines. Exp Oncol 2008;30:133-8. Vahidi AR, Dashti-Rahmatabadi MH, Bagheri SM. The effect of Teucrium polium boiled extract in diabetic rats. Iran J Diabetes Obes 2010;2:27-32. Safaeian L, Ghasemi-Dehkordi N, Javanmard ShH, Namvar H. Antihypertensive and antioxidant effects of a hydroalcoholic extract obtained from aerial parts of Otostegia persica (Burm.) Boiss. Res Pharm Sci 2015;10:192-9. Kumar VR, Inamdar MN, Nayeemunnisa, Viswanatha GL. Protective effect of lemongrass oil against dexamethasone induced hyperlipidemia in rats: Possible role of decreased lecithin cholesterol acetyl transferase activity. Asian Pac J Trop Med 2011;4:658-60. Dourakis SP, Sevastianos VA, Kaliopi P. Acute severe steatohepatitis related to prednisolone therapy. Am J Gastroenterol 2002;97:1074-5. Shalam MD, Harish MS, Farhana SA. Prevention of dexamethasone-and fructose-induced insulin resistance in rats by SH-01D, a herbal preparation. Indian J Pharmacol 2006;38:419-22. Wang M. The role of glucocorticoid action in the pathophysiology of the metabolic syndrome. Nutr Metab (Lond) 2005;2:3. Soliman HA, El-Desouky MA, Hozayen WG, Ahmed RR, Khaliefa AK. Hepatoprotective effects of parsley, basil, and chicory aqueous extracts against dexamethasone-induced in experimental rats. J Intercult Ethnopharmacol 2016;5:65-71. Shahraki MR, Arab MR, Mirimokaddam E, Palan MJ. The effect of Teucrium polium (Calpoureh) on liver function, serum lipids and glucose in diabetic male rats. Iran Biomed J 2007;11:65-68. Fiorentino A, D'Abrosca B, Pacifico S, Scognamiglio M, D'Angelo G, Monaco P. Abeo-abietanes from Teucrium polium roots as protective factors against oxidative stress. Bioorg Med Chem 2010;18:8530-6. Bedir E, Tasdemir D, Çalis I, Zerbe O, Sticher O. Neo-clerodane diterpenoids from Teucrium polium. Phytochemistry 1999;51:921-5. Elmasri WA, Yang T, Tran P, Hegazy ME, Hamood AN, Mechref Y, et al. Teucrium polium phenylethanol and iridoid glycoside characterization and flavonoid inhibition of biofilm-forming Staphylococcus aureus. J Nat Prod 2015;78:2-9. Bahramikia S, Yazdanparast R. Phytochemistry and medicinal properties of Teucrium polium L. (Lamiaceae). Phytother Res 2012;26:1581-93. Eken H, Ozturk H, Ozturk H, Buyukbayram H. Dose-related effects of dexamethasone on liver damage due to bile duct ligation in rats. World J Gastroenterol 2006;12:5379-83.